The motherboard is the main component of any branded or assembled PC, laptop, tablet or a mobile phone. Now you must be curious, why it is called the motherboard? The motherboard is a Printed Circuit Board which acts as the main platform for communication between all other components of a system. All the other computer parts are either directly installed or connected to various motherboard components and all the data is transferred between them through the motherboard. The oldest of the main boards, these motherboards were used in earlier 286/386 or 486 computers. The AT means the board consists of advanced technology(AT) power connectors. There are two power connectors of 6 pin each mounted on the AT motherboards. The AT motherboards were available in the early 80’s. The ATX motherboards started in 90’s and are still available. The ATX connector on the motherboard consists of a single connector. These boards are used for P2/P3 or P/4 processors. 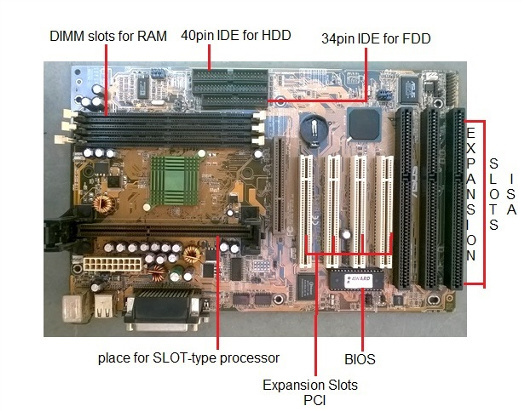 The motherboard consists of various components which have their own role to play in the functioning of a computer. Let us discuss various motherboard components and know their definition and role. ISA slots. These were the oldest expansion slots in the history of motherboards. They were found in AT boards and are identified by black color. Conventional display cards or sound cards were installed in these slots. The full form of ISA is Industry Standard Architecture and is a 16- bit bus. PCI Slots. The full form of PCI is Peripheral Component Interconnect. The PCI slot is one of the important motherboard components today and is vastly used to install add-on cards on the motherboard. The PCI supports 64-bit high-speed bus. PCI express. Also known as PCIe, these are the latest and the fastest component of the motherboard to support add-on cards. It supports full duplex serial bus. AGP slot. Accelerated graphics port(AGP) is specifically used to install a latest graphics card. AGP runs on a 32-bit bus and both PCIe and AGP can be used to install high-end gaming display cards. SIMM slots. The full form is a single in-line memory module. These slots were found in older motherboards, up to 486-boards. The SIMM supports 32-bit bus. DIMM slots. The full form of DIMM is a Double inline memory module. These are the latest RAM slots which run on a faster 64-bit bus. The DIMM used on Laptop boards are called SO-DIMM. Another vital motherboard component is the CPU socket which is used to install the processor on the motherboard. Some important sockets are explained below. Socket7. 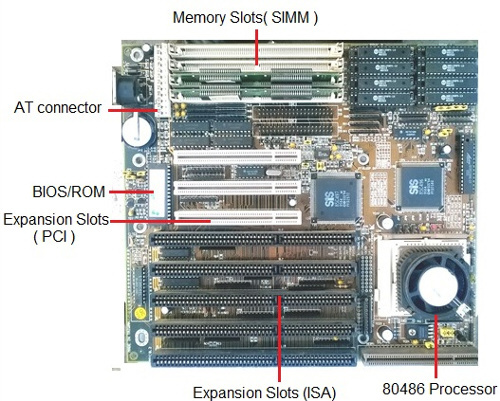 It is a 321 pin socket that supported older processors like Intel Pentium 1/2/MMX, AMD k5/K6, and Cyrix M2. Socket370. It is a 370 pin socket that supports Celeron processors and Pentium-3 processors. Socket 775. It is a 775-pin socket that supports Inter dual core, C2D, P-4 and Xeon processors. Socket 1156. 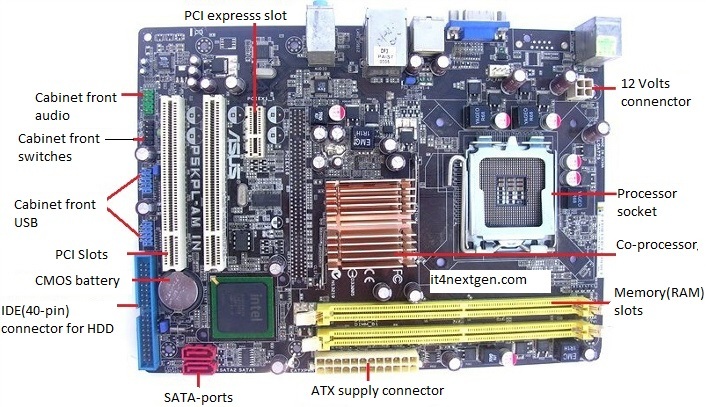 Found on latest types of motherboards, it is an 1156-pin socket that supports latest Intel i-3, i-5 and i-7 processors. Socket 1366. The socket is of 1366 pins and supports latest i-7 900 processors. The full form of BIOS is Basic Input Output System. It is a motherboard component in the form of a Integrated chip. This chip contains all the information and settings of the motherboard which you can modify by entering the BIOS mode from your computer. The battery or a cell is a 3.0 Volts lithium type cell. The cell is responsible for storing the information in BIOS and the full form is Complementary Metal Oxide Semi-Conductor. In order to receive power from SMPS, there are connectors mounted on the motherboards. AT connector. It consists of 2 number of 6 pin male connectors and is found on old types of motherboards. ATX connector. The latest in the series of power connectors, they are either 20 or 24 pin female connectors. Found in all the latest types of motherboards. The Integrated Drive Electronics (IDE) connectors are used to interface disk drives. The 40-pin male connector is used to connect IDE hard disk drives and the 34-pin male connector connects to Floppy Disk Drive. Latest in the series, the connectors, Serial Advance Technology Attachment(SATA) are 7-pin connectors to interface latest SATA hard disks or optical drives. They are much faster than IDE interface. The co-processor is one of the important motherboard components and helps the main processor in mathematical calculations and computer graphics. The cabinet in which the motherboard is installed has many buttons that connect to the motherboard. Some of the common connectors are Power Switch, Reset Switch, Front USB, Front Audio, Power indicator(LED) and HDD LED. Choosing a right type of motherboard that is compatible with other parts of computer is vital step in determining the overall speed of your PC. Once you learn about various motherboard components, you can easily assemble your own PC or solve the basic hardware issues in motherboard. I want P1 mother Board ( 10 to 15 Numbers ) with Processor & RAM in Good Working condition. Even lesser Quantity is also acceptable. it may look quiet complicated but its very well and understandable. Tremendous description about mother board…. Need for the description about processor and its history. Hi Adam, yes there are many options to do so. You can use msinfo32(system information)command in run window or use CPU-Z software to find more details about motherboard and other hardware components. Check my latest article on how to find type of motherboard without opening cabinet. Thanks for the information , very sweet and easily understandable . Super Anna most use fully this information thanks Anna thanks ………. very good information.motherboard types and components Different between AT and ATX. Thank you for the your information. nice job..but I will love you to explain about the north and south bridge of a motherboard..tank’s!! !